Saturday, Feb 11th, I went on a simploring tour to Anduril. 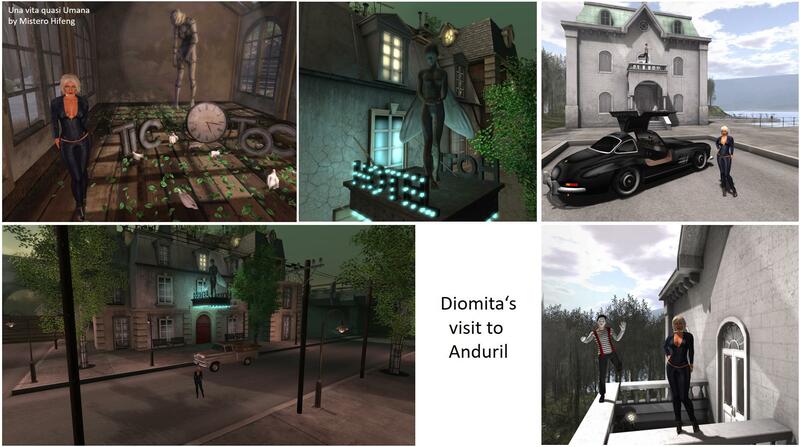 Inary Pey wrote about it in her blog “The streets and paths of Anduril in Second Life“. Anduril is a sim with 3 faces. Upon your landing it is first of all a small town as you land on the main street. There are cars, street lights, sidwalks, shops, some trees, just what you expect from a small town. Every thing is nice, clean and neat. maybe there could be more people on the street but that’s Second Life. The town and the the whole sim is somehow dominated by a lighthouse, you can see it from everyhwere. Just where you land is a hotel and above the entrance is at well lightened statue. Inara writes it is a statue from Marcel Marceau. At least it is extraordinary for sure. At the end of the street is a big old villa. If you go in, you’ll find a big room that is used for ballet and on the balcony is a (ballet?) dancer. But Anduril is not just a little town. if you turn right and walk through a passage you can look at the backside of the houses and it looks not neat and clean anymore, but abandonned, as if the people left the place in a hurry. In one old building there’s an art installation of Mistero Hifeng .. that leads to the second face of Anduril: art. 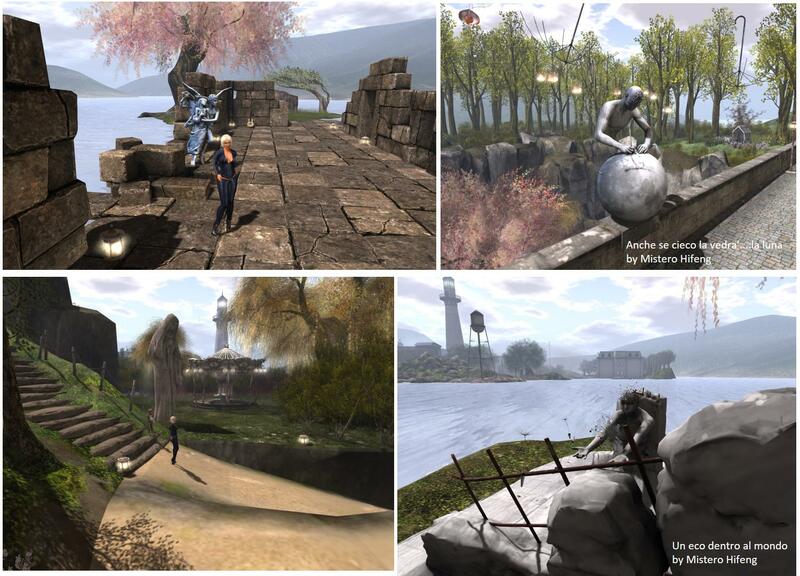 There’s not just the statue of Marcel Marceau, other pieces of art from Silas Merlin and Mistero Hifeng and others are spread over the sim. The third face of Anduril is nature, more a park just next to the town. There are places to sit and cuddle, places to enjoy the view and there’re other pieces of art in this park. Overall, there’s a lot to discover and explore at Anduril and my one hour visit went by very quickly. Thank you Marina Breen and Asa Vordun for providing Anduril to the public. For me it is the best way to espose art, not in a museum and packed but in a park more by accident, when you’re in the right mood as you’re relaxed when walking through a park. There you can you discover each piece and they look different outside embedded in the environment.